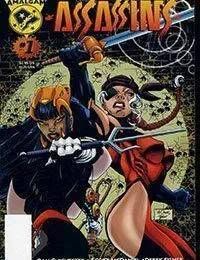 On Earth-9602, two deadly assassins named Catsai and Dare decide to take on The Big Question. On their way they easily kill Deadeye and Lethal and defeat Wired. After The Big Question blinds Dare, Catsai manages to deliver the fatal blow.<br />Dare The Terminator is an amalgam of Marvels Daredevil and DCs Deathstroke The Terminator.<br />Catsai is an amalgam of Marvels Elektra and DCs Catwoman.<br />The Big Question is an amalgam of Marvels Kingpin and DCs Riddler.